Graduation rates in the Long Beach Unified School District increased for the fifth year in a row, again surpassing state and county rates. Students of color in Long Beach schools also outperformed their peers countywide and statewide, and seven high schools here reported graduation rates above 90 percent. LBUSD’s overall graduation rate is 84.2 percent, up 0.2 percent over last year and surpassing both Los Angeles County’s rate of 81.3 percent and California’s 83.2 percent. The seven high schools now posting graduation rates above 90 percent include the California Academy of Mathematics and Science (at 99.4 percent), along with Avalon, Lakewood, Millikan, Poly, Renaissance and Wilson high schools. Approaching the 90 percent mark is Cabrillo High School at 89.6 percent, and Jordan High School at 86.3 percent. Both Cabrillo and Jordan showed significant improvement over prior years and both now surpass county and state rates. The school district’s African American and Latino students also outperformed their peers at the county and state levels. The African American graduation rate in LBUSD is 81.8 percent, far surpassing both California’s rate of 72.6 percent and the county’s rate of 72.5 percent for the same sub-group. LBUSD’s Latino students graduated at a rate of 81.8 percent compared to the state’s 80 percent and the county’s 79.3 percent for the same sub-group. Latinos, African Americans and whites represent the three largest groups of graduates in LBUSD. Latinos, who are by far the largest ethnic subgroup in the school district, surpassed or equaled the graduation rates of white students at several high schools here. Some smaller high schools achieved a 100 percent graduation rate for multiple subgroups. Renaissance reported a 100 percent graduation rate for its 31 African American students. At CAMS, almost all subgroups achieved a 100 percent graduation rate. LBUSD’s overall graduation rate has increased by about 6 percent over the past five years. The steady gains are the result of a concerted effort to provide additional support to students who need extra help. Educators here analyze data by school and demographic subgroups to make sure they provide support where it’s needed most. Such analysis is part of the school district’s careful implementation of the state’s Local Control Funding Formula, which provides flexibility so that individual schools can meet their students’ specific needs. ON THEIR WAY - Members of Lakewood High School's Class of 2016 participate in commencement at Veteran's Stadium. 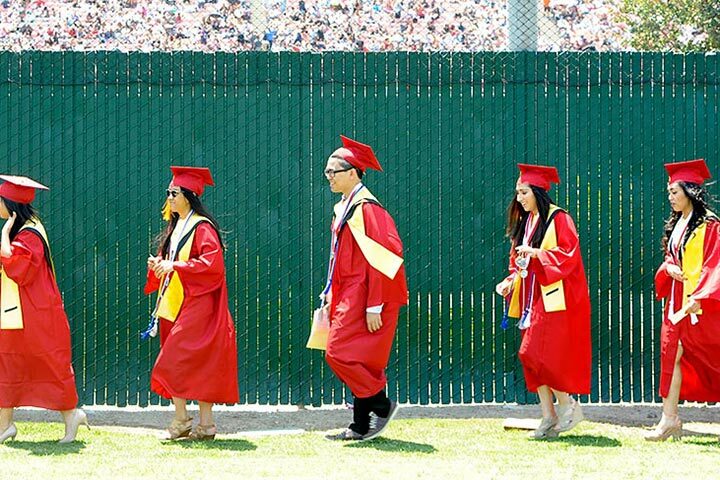 Lakewood is among seven LBUSD high schools to achieve a graduation rate above 90 percent.